In this episode, Harold Reitman, M.D. speaks with Shawn Smith M.Ed., CCC, founder of Don’t Dis-my-Ability. He discusses the importance of advocacy, growing up with undiagnosed ADHD, his journey through school, and the state of neurodiversity awareness in Canada. 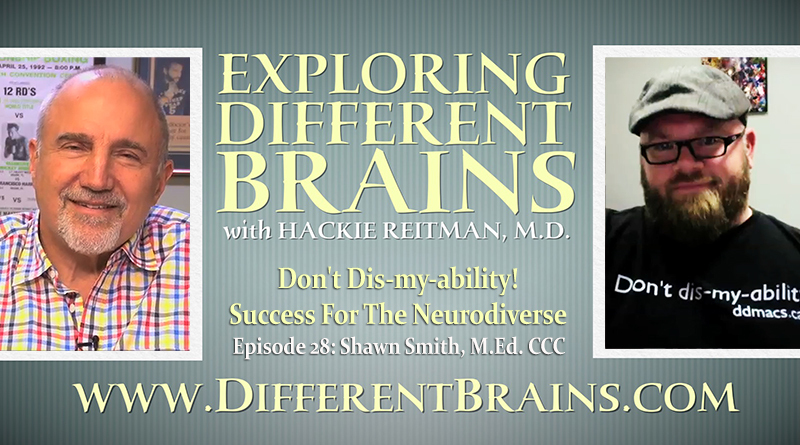 Hi I’m doctor Hackie Reitman welcome to another episode of Exploring Different Brains, today we bring you all the way up to Brunswick, Canada to Shawn Smith, and he’s the founder of Don’t Dis – My – Ability, a company that advocates and offers counseling related to neurodiversity. How are you doing Shawn? I’m doing great Hackie thanks for asking. How are you doing? I’m doing alright. You know you’ve got a lot of tough Canadians up there, they’re tough, they’re tough. Tell us about yourself Shawn. You’ve done some great things and I like your style and I like your shirt. Don’t dis-my-ability. Right the way that it really came about Hackie and I’m so excited to connect with Different Brains because I’ve been practicing neurodiversity without really even knowing it. I also identify as being neurodiverse. I was diagnosed at age thirty with ADHD and my life forward then was so much, you know so different from what it is now and so in part of what I do is kind of sharing my story with people to relate to and I find that’s one of the things that makes me an effective communicator and counselor and psychotherapist is that I have a unique insight into what it’s like for individuals with different invisible disabilities, having gone through thirty years of hell I mean four years to finish three years of high school, 3 attempts to get the 18 credits required to graduate, including failing grade ten math four times to being diagnosed at age thirty, going back getting a Master’s degree in counseling psychology and challenging the system along the way cause I found as an individual with a disability I was trying to apply to different programs and not fitting in the box they had available so I kind of saw it you know I had two options I could turn and go the other way or I could challenge the system and stretch that box which is what I’ve been able to do. What was your main diagnosis was it just ADHD not that that’s not a lot by itself or did you have any co-morbidities with that? ADHD. I was borderline math disability but that was it, which is pretty rare I mean there’s usually a higher percentage of co-morbidities associated with ADHD so again unique in that way. So now let’s fast forward. So now we went from you’re struggling to get through high school, it’s taking you four years to get finish three years, you’re strugglin, strugglin, and now we fast forward to now and what kind of educational degrees have you gotten and what are your official titles now? Okay well I have tons of interesting stories but when I look back at where I’m at now and I guess kind of going back to the future, right? When I was in high school I started playing football in my first year. In my second year I was an all-star. And so as an all-star you get packages from every major European University for their football team and it was such a high of going down. I almost felt like a peacock with my feathers. And as I opened one by one, I just went down, slipped further down into the rabbit holes realizing I couldn’t go to any of these schools. And so a CEGEP in Quebec they have a CEGEP system which is kind of like a prep school system and so for the first time in the school’s history John Abbot College came recruiting in New Brunswick and the head registrar was also the defensive coordinator, and they snuck me in and without them I wouldn’t be anywhere so I’m very very grateful and appreciative to them taking a chance on me and I’m actually one of their success stories. And after I finished there I went to a place where I did my B.A. and I don’t talk about that school because when I went back to upgrade as a mature student and I tried to access their affirmative action policy as a student with a disability, I was discriminated against twice. And I filed two separate human rights complaints against the university and tried to access their inclusive policy and rather than do the right thing, they hired a huge law firm to take me on. Wow, what a great story! We might have to write a screenplay about you! Oh trust me I’ve got all kinds of great stories about, for me the way that I see it is that and I think this is where you and I connect and how our companies are so much alike you know society has fixated on the square peg and we’ve tried to manipulate, contort, shift, do whatever we can to try and cram it through the round holes of society and the shift that we have, our take is there’s nothing wrong with an individual it’s society. So my work has been on pushing the boundaries and stretching that hole and informing society of what’s right with us, instead of focusing on what’s wrong as though we’re parts of a machine that once identified or labeled can be fixed which isn’t the case. And I think if we can do that in a positive way what I’m finding is a lot of the institutions and individuals who would be glad to help if they had more knowledge, they’re just ignorant. I don’t mean they’re stupid I mean they’re ignorant, they haven’t been exposed to it I mean I’m a perfect example. Here I was I made this whole movie inspired by my daughter taking on the whole system and I didn’t even know until after she got out of college that Rebecca also, on top of her other stuff had Asperger’s and was on the autism spectrum. I didn’t even know what Asperger’s and autism were, and what I’m seeing now is that we’re all on a spectrum of sorts and everybody’s got a little bit of this or a lot of that and when you start adding up ADHD, I don’t know what are the statistics for ADHD up there in Canada, what’s it like ten percent or something? I don’t know what the stats are but when I hear people say that it’s over diagnosed I challenge that. I actually think it’s underdiagnosed, because of what we know of ADHD and other invisible disabilities, there’s going to be more, not less, so if we’re going to be focusing on there being less and making this issue of being over diagnosed it deflects from what actually needs to be done you know instead of focusing on a system where people perceive to be broken. Why aren’t we just looking at the individuals affected and putting our energy and resources there on how to help people? Now what position did you play in football? I was defensive tackle and what was really cool about CEGEP in Quebec is that it’s a Canadian field, but they play American rules, so when I made the switch from high school to college I played nose tackle which was awesome because with American rules it was like the NFL, there’s no yard between the defensive line and the football. So you could be right there, right at it, whereas in Canadian football you have to start a yard back so you’re already running more than you want to, as a big person. So I liked that I could be right there and sometimes I was actually able to swat the ball right out of the center’s hands before it could get to the quarterback. Wow, you must have been quick. I’m pretty quick for a big man. Tell us from your point of view the biggest single challenge, aside from the fact that society wants one size fits all, okay. What’s the biggest single thing you think our audience might not get about ADHD from your point of view? Well when I meet somebody and they expose to me that they have ADHD one of the first things I’ll say is welcome to the world of the uniquely gifted. I believe that not only, I got goosebumps, not only in my experiences of going from failing at everything, I didn’t learn to count until I was in my twenties, I tied my shoes the wrong way before I tied them the right way until I started taking medication, to being at the top of my class for my Master’s degree. So the big shift in seeing that I have specific gifts, so I focus on those and it’s not that I don’t have challenges like I try to bring in people for whom my challenges are their gifts right to build capacity and community and to lift each other up and help each other out so for me and I talk about this in a video that I made and I talk about neurodiversity and when I talk to parents a lot of my work is with parents. To get them to understand and I don’t like to frame it as the damage that’s been done but I frame it in a way that when you think of from the time the individual wakes up until they go to bed and their interactions and where they’re going and who they’re with. What percentage of that is being told that what they’re doing is not right and that is wrong. And to flip that around and to think okay if you were them and you know people will share well they’re isolating and don’t really talk much and when I flip it around and say well you know if ninety percent of your day was being told that what you’re doing is wrong and not right, would you want to spend time with you? When did you have the epiphany to start Don’t Dis-My-Ability? It kind of came to me shortly after my diagnosis I was working in the Northwest Territories at a residential treatment facility for at-risk youth way up in Northern Canada and one of the residents was on 24-hour watch and I was at the door and things just started flowing and coming together. I describe it as you know it just always seem the pieces never fit together. The pieces of the puzzles that are my life and all of a sudden they just started to come together in ways that I mean I could process my thoughts and emotions just so quickly and things that didn’t make sense all of my life just started to make sense and so I actually wrote a rap song and it was called Don’t Dis My Ability and I just had this kind of and I’m not a musical person but a beat in my head and I just started to talk about my life and don’t dis my ability and talking about perceived limitations by society and how we often think we can’t do something without ever trying it and knowing that my brain was kind of given a jump start by medication and so things just started moving so quickly and don’t dis my ability was something that popped into my head and I just couldn’t get it out. And so it just kind of became my anthem and I developed a mantra based on that don’t dis my ability I may not learn in a conventional manner but that doesn’t mean I can’t learn only that you have not been able to reach me. So coming up with unique innovative ways to try and reach people which has helped them. I’ve gravitated and understand things in a way because it just wasn’t framed in a way that they can comprehend or understand until I do it for them. Shawn talk about from your perspective your view about medications in general? Sure. Well I would put it this way because I have met people who are for and people who are against I guess and some people who are on the fence and so I don’t promote medication but what I do is I promote my story and what medication has done for me. And if somebody were to say you know we’re gonna take that away and it would be gone forever, the best for me to compare it to would be wrongful imprisonment how dare you. I was kind of trapped in my own mind and in my own thoughts and now that I am free of that and the thought of somebody threatening to take that away and put me back in that place is not something that I ever want to visit. Now my experience I acknowledge is pretty extreme but I think the first thing that people need to do and you talking about, you know, people not knowing what their kid’s interests are kind of frames that because you need to know your children well enough and have a good enough relationship with them that you can talk about anything, and medication is something that needs to be discussed but there are other strategies that can be put in place but that requires parenting. That doesn’t mean the TV is parenting which happens too much, or video games or electronics are parenting. We can’t expect kids to know if somebody is not teaching them. So if you’re not modeling for your kids the behavior you want to see, you can’t just expect it to happen. I have great self-awareness in that I can do this or I can do that. If my wife wants to have a conversation with me, we have an understanding, if you want to compete with the TV that’s your choice, but you’re not going to win. So we both know that the TV needs to be turned off and understanding if our kids are hyper-focused, if they’re doing something and I have some great stories about my kids and talking to my son who is “Y” characteristics of ADHD but I mean boy he’s smart as a whip. But when he’s hyper-focused on something and I say his name, I may have to say it, two, three, four times and the realization that on the last time I have raised my voice to say his name. Well when someone is hyper-focused, that is the equivalent of scaring them awake. And so his response to me is to yell back and I would say, why are you yelling at me? And he’d say because you yelled at me, and he’s not wrong. So I know that when he’s in that space, the times prior to me raising my voice didn’t happen, because he didn’t hear it. So to argue that is futile. So I know that if I want his attention when he’s in that place that I need to go maybe put my arm around him. I need to do something that’s comforting in a way that I am garnering his attention, not demanding it, because it sets someone back, so for parents I think there are strategies that can be put in place but I think a lot of times it requires work on the parent or guardian and it’s overwhelming because when they look for resources there are tons and tons of books on what to do and what of the first things I’ll tell people is toss those books aside because the difference between thinking and knowing is experience and we have too many people who think they know without the experience. So what I offer is that I was once that kid and so I can relate and identify what’s happening and what their thought process is like and where the kid’s at and really help them to refocus and reshape and question some of the choices that they have made in their parenting style. Not in an accusatory fashion, but we share a lot of laughs and a lot of tears about there are some things that they’ve done that have not been necessarily the best, not the best benefit for their child, but easy in the moment. Well it makes all the sense in the world. You know you’ve taken a walk in their moccasins so to speak and so you’re in a great position. Have you written any books? I haven’t but I have a title in mind for one I’d like to write. One of the challenges I have Hackie is that my fingers can’t keep up to my brain. And so I try to record things and do audio and go back, but I kind of compare people with ADHD kind of to dogs in a way that if anybody has tried to train a dog or had a puppy, dogs like to move forward. They don’t like to move backwards. It’s an uncomfortable feeling. And that’s kind of how I feel. I’m just constantly moving forward so I’m piecing some things together and I’m trying to get some help. But I have a title in mind. We’ve all heard the term “left for dead” my book title would be “left for down.” And although I don’t have a book on the go Hackie, one of the things I am doing, I’m getting involved in the entrepreneurial startup community which is just right now, it’s flourishing where I am and I recently received catalyst funding from the Pond Deshpande Centre and so I was awarded a grant to team up with an animation studio, to animate my thought process. So we’ve had our, we actually got the funding and I’ve had a meeting with the animator and he’s worked on Family Guy, Caillou, Sesame Street, so very well known in the industry and we’re gonna have a Kickstarter campaign coming out so we’re just working kind of on the trailer and conceptualizing things, we’ll put out a trailer and have a Kickstarter campaign to try and get enough funding to make it what it needs to be. We actually met, we were both working at a night club. I’ve had so many jobs. You were a bouncer at a night club. What a fascinating story, you’re full of them. I love listening to you. Watch our interview with Matthew Schneps and I’ll tell you why I’m telling you about Matt Schneps who I’ll introduce you to sometime. Like yourself, he has a beard, very interesting guy up in Boston. He is the founder of a partnership for visual learning that he put together with the Smithsonian, Harvard and MIT. He was an astrophysicist by trade and in my interviews with him, he’s a funny guy. I did watch one, now that you mention it, I remember he’s a unique cat. He is and he says, I’m gonna ask Joe Physicist why can’t we just give people the tools they need if parts of their brain don’t, and I said what do you mean, and he goes, ask me how much is 7 times 6? I said how much is 7 times 6? He goes, I don’t know! But I have a calculator that can figure it out for me. The only school he got into was MIT, you know because he couldn’t do well, he was dyslexic and couldn’t do math, but he’s absolutely brilliant. And again it goes back to what you’re saying that what is with this one size fits all or what Shawn is calling the square peg? You know why is it? Why can’t we just take everyone’s gifts and use them? Well and I actually, I kind of pegged the term, “the inclusion illusion” because as an advocate and having to battle for things, and my wife is a great example of it, she used to call me a conspiracy theorist, but as I try to access different supports and services, I kind of understood that part of my gift was looking at systems and processes and I could learn more from the absence of information than I could by what was actually provided. And so digging and challenging government and the university I had gone to and trying to affect positive and social change by again not fitting in that square box and challenging people saying “oh no a university wouldn’t do that,” well they did, twice. And that our provincial government and that’s another one that I wrote a paper called Systemic Discrimination is Commonly Practiced by the Providence of New Brunswick: The Comprehensive Analysis of The Equal Employment Opportunity Program, where you know I was diagnosed with a disability and I thought, okay I’m going to get a cushy government job with this affirmative action program and I can’t tell you how many jobs I applied for, but I can tell you, I had no interviews and in Canada in New Brunswick, especially being bilingual is a huge asset so I’m fluent in both English and French. I had a university degree, newly diagnosed. I couldn’t get an interview to safe my life and so when I went back to upgrade I turned the five courses that I had to take as a mature student to bring my GPA up I focused on that particular program and in the 25-year history of that program, nobody had asked the questions that I did. They had never compiled information, more than I think twenty million dollars spent and no one, like the program had never been audited, and so in looking at these specific programs, and when people tell me, oh the system doesn’t work I challenge them right away, because by stating that it doesn’t work, it implies that it was intended to work in the first place. And the people who make the rules seldom have to follow the rules and so in being an advocate and pushing the boundaries and limits, I challenge things that people see or and sometimes things people don’t see because they’ve been forced into a situation where they needed to. For me I was early 30s, my wife was in school I had two small children, both under the age of four and trying to decide, wow I just got goosebumps, what kind of person do I want to be, do I want to be the kind of person that my kids are proud of? Or do I want to just pretend like none of this ever happened and I couldn’t do that. I was on a path and you’re either coming with me, or you’re not. I tried to collaborate with people, you know inclusion is happening, you’re either with me or you’re not, so let’s do it together, but if you’re not you gotta know I’m coming. You know this is what’s happening there’s no moving backwards like any movement in the opposite direction is not in anyone’s best interests. You know so a shift in government or in politics, you know it’s always interesting to hear what they say, because I hear what they’re not saying. Very well said. You hear what they’re not saying. That’s very profound. What do you think of your new leader Trudeau up there? For me it’s not so much a matter of the leader, I just I generally don’t trust politicians and one of the reasons why I wear this shirt is because I don’t want to put on what I would call a suit of armor, which deflects any type of personal accountability or responsibility, so to ask a politician a question, I’m looking for a yes or no answer and the fact that they can’t do that and dance around it, tells me that a lot of them which means that if I can’t have a candid conversation, and I can’t ask you a real question you give me a real answer then this isn’t a real relationship and that’s not a real dynamic that I’m going to invest my time into, because it’s a waste of my time. Have you seen a lot of metaphors for you between being a defensive nose tackle in football and what you’ve experienced in life? No, I haven’t really other than I’ve had a push and keep pushing not really, but it’s one of those things where you know without that college and I have a tattoo with their logo on my shoulder, it’s the only tattoo I have and you know I called to check in, of the probably 30 students that they recruited out of Province I was undiagnosed, there were only two of us that actually finished the program, graduated. And the other student was diagnosed with a learning disability at the time and I was not diagnosed with ADHD, and we’re the only two. Right? So what does that say about us and our determination right? I think that’s one thing that people really don’t understand is how determined we are and how we can be and part of it is, for me anyway and I’ve been working with more and more entrepreneurs with different forms of invisible disabilities to help them kind of turn things off. I don’t watch TV really, I don’t watch the news and I don’t have cable and the reason being is that I’m so heavily impacted by what’s happening around me that I feel everything. And by allowing all of that information into my head and into my thought process distracts me from the things I feel I can affect positive social change. And so I limit, Facebook I use for my business really, I love to cook, I also call myself the ADHD Chef and so I try to get into my zone so you know when people are on Facebook and social media, whether they acknowledge it or not, they’re creating a hierarchy in their minds of where they put themselves, based on what they’re seeing and my view is that as long as you’re spending time on Facebook looking at other people’s relationships, how much time are you actually investing into your own and challenging people to look at things that way. If somebody’s talking about, or spend an hour or two hours on Facebook or social media every day and that adds up. How much work are they putting into their relationships with their partner, their spouse or their kids, so we’re trying to flip it around and this is a really interesting take that I’ve used with entrepreneurs who are kind of following my lead and seeing the benefit of, you know it’s not that what’s happening in the world around us is not important. It is, but I don’t need to know about every gruesome thing that happens on this planet when it happens, because there isn’t something I can do about it in that moment, but if I’m exposed to that I can’t help but feel the emotions that come with that that people should feel but for me it’s too much. I get overwhelmed and anxious and so I need to focus and limit my attention on the things I feel like I can affect positive social change. And using that with entrepreneurs you know you’re starting to gravitate more towards me. The individual that I was helping, well the animation studio that I’m teaming up with, you know we have become really good friends because he gravitates to my kind of way of thinking and my thought process of understanding okay this is what I need to do, this is how I break it down to get there. Anything else that’s outside of that, if it doesn’t have to do directly with me, then it doesn’t have to do directly with me, so why am I going there? Well and you know, again that’s very well said. One of my mentors Bernie Karcinell who is 77 years old, very interesting guy himself, but he always makes me answer the question: “what are you trying to accomplish?” And many times we don’t take that step back and say what are we trying to accomplish and parenthetically of course, what are your priorities? Well in the start-up world, I’m starting to understand now and being involved in start-ups, you know one of the things that businesses want now is what value are you adding? And that’s the bottom line, because if you’re not adding value, you’re just not adding, right? So how is it that we talk ourselves into adding value and this is something that I’m trying to help different individuals with invisible disabilities who are uniquely gifted and trying to help them find employment and the biggest challenge being this Human Resources have boxed people out, because they want a certain education in order to hire somebody. I have met individuals who, you know one individual could type 80 words a minute, and they wanted to work in the food industry. And so part of what I do when I meet somebody who has a unique story and a unique gift, I contact my network of people, I mean I’ll contact my friend who owns the animation studio and say, “hey can you look at this person’s resume you know because I love technology but I don’t know the ins and outs of all the certifications and all that and he’ll tell me good or not or this person has a gift, maybe I can connect them with this organization.” So it’s about trying to build people up, trying to build capacity within community, and one of the things that I find lacking, especially, I’m a for-profit company and my experience in the non-profit field has not been that great, because their funding is dependent on really government grants, or whatever it may be and they’re gonna cling to that. Their life depends on that and so one of the things I often say in this field if you are not trying to work yourself out of a job if you truly do not believe that someday you could work yourself out of a job you are in for all of the wrong reasons, so building capacity, it’s about lifting people up, not securing your own position if we’re both creating dependence, you can’t start creating, if we’re both promoting independence, you can’t create dependence by trying to keep people where they’re at. If you want things done differently, you need to take a different, individual approach. What you have to do within your organization is empower the individual to seek your own level and one of the ways you do that is by letting them choose what they want to do, when they want to do it, how they want to do it, as long as it fits in with your overall philosophy, what you’re trying to accomplish, so I think as a society we’ve got to recognize that one size does not fit all and I agree with you 100%, I couldn’t agree with your philosophy more and it comes down to the individual which if you think of it holistically as giant corporations, that’s what the entrepreneur is, that’s what it is. Yep in a big way, in a big way. And the mom and pop businesses which I don’t know how it works in Canada, but my folks had a gas station in Jersey City where two people with a high school education could make a living for their four kids and get them all educated and the mom and pops, the equivalent of that now is the start-up, the start-up usually technology-based company. I very much so, interestingly enough, my parents were also entrepreneurs and owned a gas station. A Shell station. Get out of town, really? Which brand was it? Oh Shell, we were Flying A that turned into Getty and it was called Tidewater back then, too. Yeah my parents have owned a few different businesses, they’ve owned a snow removal and landscaping companies, they still own the snow removal, my mom’s deceased now but they own, they’ve built an A&W restaurant, the fast-food restaurant and later sold that. So I’ve been around it all of my life, but in that I’ve always felt like if I was going to do anything, I was going to do that for them. I didn’t have this notion any time I could build my own business. It almost felt like they were keeping it going because I was going to need that to fall back on later. You know like that’s where I was at. I mean my parents had me scared that I was going to be working at McDonald’s and I mean I grew up in a suburban middle-class neighborhood. Whereabouts did you grow up, Shawn? Fredericton, New Brunswick, Canada. We border, New Brunswick borders the state of Maine so that’s where we’re at. Fredericton is the capital city of New Brunswick and it’s a very nice picturesque place, but it’s also very conservative, and that’s been one of the challenges regardless of conservative or liberal government, it’s still quite conservative. And so, even though when I talk to people one of the things I say is that everybody knows somebody with a disability. Statistically it’s impossible not. And if I’m engaging with someone that claim to not, then I just end the conversation because it is just that sheer ignorance and I’m not going to waste my time but it is true. Everybody knows somebody with a disability and what I find challenging when I’m challenging systems is that if I were to speak to any one individual and say, is this right? We know what they would say the answer is no, but because they have this identity this conglomerate or you know this business that they can hide behind, it takes away any type of personal accountability, it’s almost like the curtain being drawn in the Wizard of Oz, right? Everybody’s scared to see what’s behind that curtain so nobody pulls, but if they did, they would see what was there, right? And for some reason, you know there are very few of us who are trying to pull that curtain open to expose everything for what it is and we’re so worried about saving face and not admitting any type of fault that we try to make about something else instead of making it about ourselves and how we can improve ourselves what we’re doing. You know as long as I can make it about somebody else it’ll never be about me. You know so that’s the type of mentality that I’m really trying to challenge. They can view me through their website which is www.ddmacs.ca which is on this t-shirt, the t-shirt is also available for sale on the website, the proceeds go into different programs. My goal is eventually to generate enough revenue through the sale of my t-shirts that I can create social programs that government can’t or won’t. Now do you have a not-for-profit running in parallel with your for profit or how do you work that? I don’t, I don’t and I don’t plan on it. My experiences been in non-profit that is profitable for the few, not the many. What is the one piece of advice you’d have for someone with ADHD or someone with a loved one with ADHD what is one piece of advice you would have? It’s challenging because although I could not handle the overwhelming amount of people who try to reach out to me, but I would say get in touch with me please look at my website because one of the things that I really feel separates me from everybody else is that everyone else has tried to identify what was wrong and try to fix you. When people come in here it’s not about what’s wrong with you it’s about what’s right with you and I have individuals and families in my office crying because of the insight that I am sharing with them. I mean I’m talking to parents about their kids not being in school and not saying, oh you know “school is not for Johnny because…”, it’s school’s not for school his thought process is so advanced that our public education system has no idea what to do with him. Well you know we had, there’s something on the books now that I thought was a step in the right direction. They’re gonna substitute the requirement in high school that you must take a foreign language they’re gonna substitute coding on computers when you want to. And I think that’s a bit of a step in the right direction to start earlier with again harnessing your interests and what you’re good at and what you want to do and what might earn you a very good living, instead of focusing on no we’ve got to have, you’ve got to do it this way. Right, and it comes down to experiential learning and I often say there are many types of two kinds of people, right? Those who like olives and those who do not. Those who like onions and those who do not. But the only way you can actually know rather than think is by experiencing it. You have to try it. So we need to encourage kids to try things, put yourself out there. The only way you’re going to figure out what you like is by finding out what you dislike. And so we need to, I have parents tell me, you know I put my kid in a million things, well make it a million and one. You know like, give them the opportunity to try something and not like it because every time we do that, it brings us a little bit closer to who we actually are. If we don’t try it all we’ll never get there. Well Shawn this has been great. Before I let you go, is there anything else you’d like to say that maybe we didn’t get to today? Well I’m excited that we found each other, you know this is something that is global and to be connecting to people in such a way that gives me goosebumps I mean I experience I get goosebumps regularly. I get high from my work every day. And for me that’s passion and the fact that you can earn a living doing that you know and so there was one thing that I want people to know in watching this and walking away from it is that our reality is what we create, not what somebody else creates for us you know there are some things that I can do in an hour when I’m in the zone that nobody can touch me and I know that in what I do in an hour somebody else may not be able to do in a week, because that’s how exceptional I am at it and so we kind of have this notion that we need to work from 9 to 5 that we need to earn so much money and this is what it looks like, and I challenge people in that notion that things look like how we project them. You know if you want to be a certain way then be it. Don’t let others kind of get in your head and you know tell you what all of the things you can’t do. You know what because most of the time people around us are negative and telling us what we can’t do is because they don’t have the gumption to actually attempt it themselves and they’re projecting their own stuff onto us. You know, so be your own person you know we spend so much of our lives wanting to be like everybody else when in reality is if everybody were the same, what kind of world would we live in, you know? It reminds me of the song “Little Boxes” by Malvina Reynolds. I don’t know if you remember that song or not, it’s an old folk song that talks about ticky-tacky boxes and houses, right, how everyone is the same and how the kids all go to university and grow up to be lawyers and doctors and business executives and you know people have this idea of what they want their kids to be. I want my kids to be happy. That’s the only thing I want them to focus on. Be happy. Well on that note, Shawn Smith, Don’t dis my ability up there in Brunswick, Canada. We’re gonna say goodbye and it’s been a real pleasure, thank you very much for all you’re doing for so many. Keep up the great work! Thanks a lot, Hackie I appreciate the interview and I look forward to connecting again soon. HR: Likewise. We’ve been speaking here at Exploring Different Brains with my new pal Shawn Smith. He’s the founder of Don’t-Dis-My-Ability, ddmacs.ca. 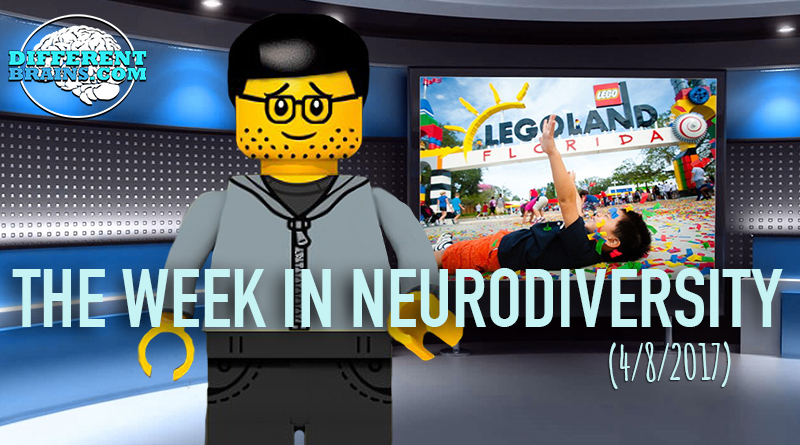 (3 min 43 sec) In this episode, virtual reality can help diagnose concussions, a new surgery can help those with Parkinson’s, and how is Legoland creating an autism friendly experience for families on the spectrum? 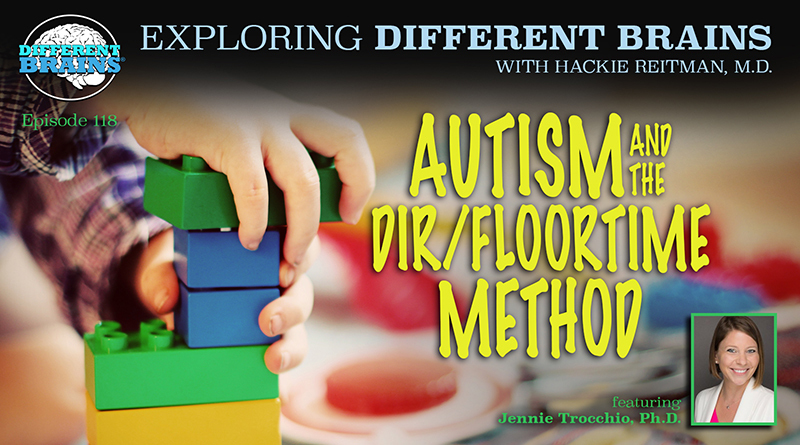 (22 mins) In this episode, Dr. Hackie Reitman speaks with Jennie Trocchio, Ph.D., an autism educator, consultant, and DIR/Floortime provider. 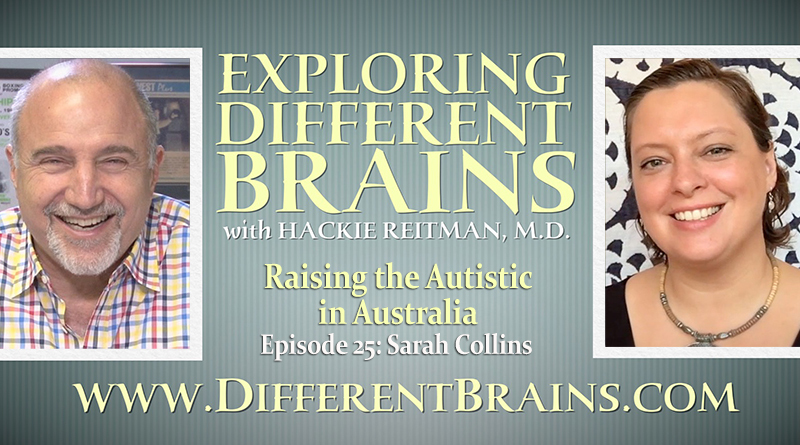 Sarah Collins of Autism CAER discusses autism awareness in her home of Australia, raising three children on the spectrum, and creating inclusive educational strategies.